“I was in Surbiton 5 years ago. I had been living in a park in Epsom for a year, suffering mental breakdowns and suicide attempts. I was referred to YMCA Surbiton by a mental health unit in Camberley, as they realised I wasn’t going to survive if I went back out on the streets. “Before I become homeless I had my own business building swimming pools. But my mum passed away and two months later I suffered a breakdown and ended up sleeping in a park in Epsom for a year. I was back on the drink, I had been sectioned and I was suicidal. With all of that I was also dealing with past child abuse. Nobody had tried to get to the root of the problems. 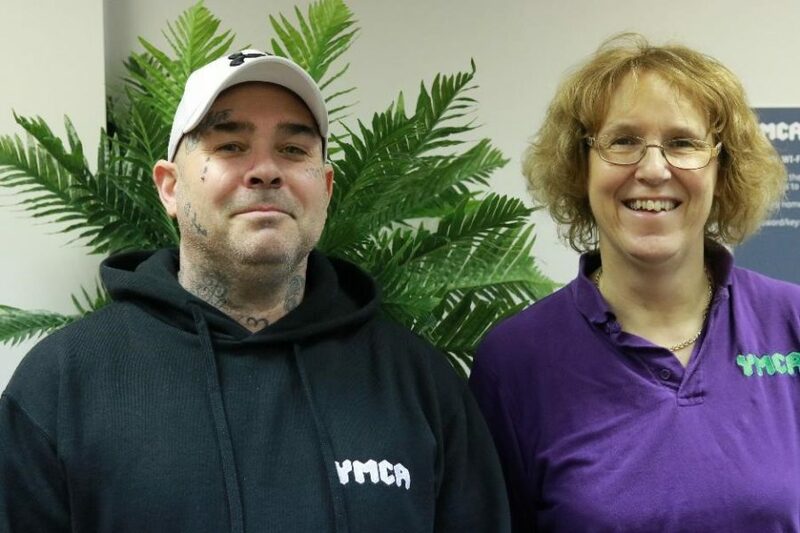 “I met Jacky who is the chaplain at YMCA Surbiton and went away on a residential chaplaincy trip, known as a Life Journey with her in the March, and that was the start of my Christian journey. “While I was living in Surbiton, I became a Christian. I also had a referral to the mental health team who carried out an assessment and diagnosed me as bipolar with emotional unstable personality disorder. It took 40 years to have that diagnosis. “I’ve been to a lot of conferences talking about my mental health and Christianity. Then last summer I went on a YMCA chaplaincy conference in Swanwick, Derbyshire and a prison chaplain approached me and said that God was guiding him towards me to hear my story. “He told me his story; that he had been in prison for the best part of his life and the night before he was due to be released from prison, a chaplain prayed with him in his cell. He just felt this massive holy experience wash over him. That turned his life around and he became a prison chaplain. He prayed for me and I had exactly the same experience. “From that moment I realised I had to put all my trust in God. As soon as I had accepted God my life became so much easier. Since then I’ve gone from leaps and bounds. I volunteer at YMCA Wimbledon. I have started up a chaplaincy gym group as I used to do bodybuilding. I’m getting residents out of their rooms who would spend all day in bed and get them into a gym environment. I also co-lead groups with Jonathan Melville-Thomas who is the Chaplain at YMCA Wimbledon, to help residents who suffer from depression, anxiety and other mental health issues. “I don’t force my Christian faith on residents but they are inquisitive, and they open up – it’s a relaxed environment. I hear people’s stories, of how they have been through the care system, for example. “The fact that I’m so open about my story encourages other people to be open too. People come to me to share their experiences and ask about my Christianity. “I’m hoping to start college in October on a DNA course for chaplaincy for a year. I want to stay being a chaplain for YMCA because we can change lives. “When I had my own business, I used to drive a Porsche and had a 4-bedroomed house but a year of homelessness has made me a far richer person than I was before. Because I appreciate everything that I’ve got. “Chaplaincy gives vulnerable people a voice, and gives them hope”.